First and foremost, no one was injured. 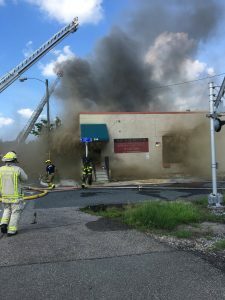 Everyone was able to get out of the building quickly and the Norfolk Fire Department moved in swiftly and worked efficiently to extinguish the fire. After 22 years at that location, August 29, 2018 was the last day The Desk Doctor was to occupy the space at 250 West 23rd St. Therefore, all furniture and chemicals had been moved out of the building to their new location at 5595 Raby Rd in Norfolk prior to the fire. Fortunately, only a small amount of equipment was lost.